For the past three years, the foundations for NTR households do not have to be built for various reasons. The district administration will have a special drive from NTR on 26th of this month. 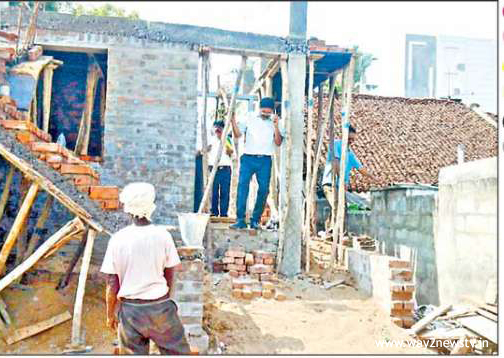 According to the district collector Laxmikantam order, from today to March 12, ten days of houses will be laid. The government has taken all necessary steps. Over the last three years, NTR houses have been placed in large numbers. Many of the households have been sanctioned for a variety of reasons, but the construction has not started. Nearly 30 thousand homes in the district have to be constructed. The district administration is proceeding with the aim of launching 30 thousand houses in these 15 days. Festivals will be held in these villages for the past fortnight. In the year 2016-17, 16 thousand 990 houses were sanctioned. Another 12,000 217 houses were granted in 2017-18. In the current financial year 2018-1912, 12 thousand 223 households have been sanctioned. 13,000 households have been sanctioned from 2016 to date under the NTR Rural Scheme. In the urban areas, 6,000 567 houses were sanctioned in the two years under the BLC scheme. Even though the state government brought down the free sand system for home constructions, the results were not expected. Structures were postponed due to lack of position certificates. Recently, the district administration has completed the issuance of position certificates. In this backdrop, the officials focused on the opening of NTR housing. Currently, the steps have been taken in favor of days for the foundation. For a fortnight, the department has been prepared to organize massive celebrations with public representatives.